Now, I must admit it's taken me a couple of weeks to settle into my workwear style. I made a little space in my wardrobe for a few things I had earmarked just for the new job. This mainly consisted of things that were slightly smarter than my everyday clobber that I wanted to get a bit more wear out of. You see, I am an advocate of having a different style personality for work. I like to look the part for my role but then be able to take it off and store away for another working day. I find it's a good way to switch off when you get home and pack the work persona away. I think I've nailed it this week and finally found my niche with that firm favourite of mine.....the good old shirt and sweater combo. Up until now, everything I've worn for my new role has been plucked from my (extensive?!) existing wardrobe. 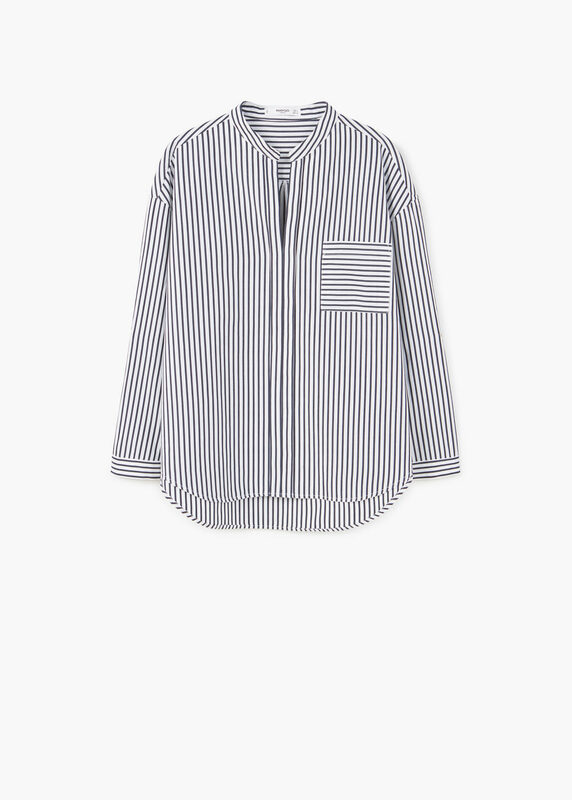 However....as is always the case with me the workwear style has lead to a purchase or two. My favourite outfit this week was my grey Pull & Bear tie front sweater from last A/W with a H&M blue stripe shirt underneath with skinny black trousers and my Office white Dapper loafers. So....hold that thought......I simply could not resist this M&S Limited Edition shirt that was reduced in the mid season sale. 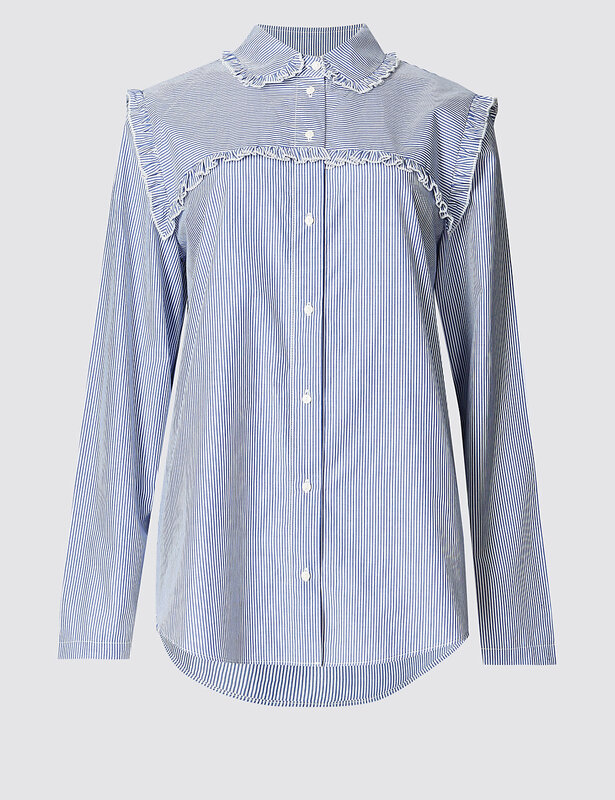 It's a nice change to the more classic shirt style with the ruffles being a continuing trend this season....naturally it had to be mine! There aren't many sizes left online but there seemed to be plenty of stock instore. One thing I will just point out though is that there is no frilly edge around the Peter Pan collar as in the the above photo....the collar is just rounded! Onwards and forwards though. I love this shirt as the gorgeous bit of detail is a fab surprise when you whip your sweater off....not that that is likely to happen anytime soon as layers are definitely the order of the day now that we are heading into chillier temps. I am pretty well stocked up on my favourite Merino sweaters but I still feel I am missing another shirt and this Mango one has been on my radar for a while....it could well end up in my wardrobe over the weekend! I am loving a bit of navy for a change but this week I realised that I have plenty of sweaters and tops but I don't really have any navy trousers to go with so I've set about putting that right! I don't want to wear my dark rinse Topshop Jamie's to work so I've been looking for an alternative and I found some dark navy cotton jegging-style trousers from H&M. These are just perfect....nice and stretchy, so easy to sit at a desk all day in comfort at a superb price point to boot! 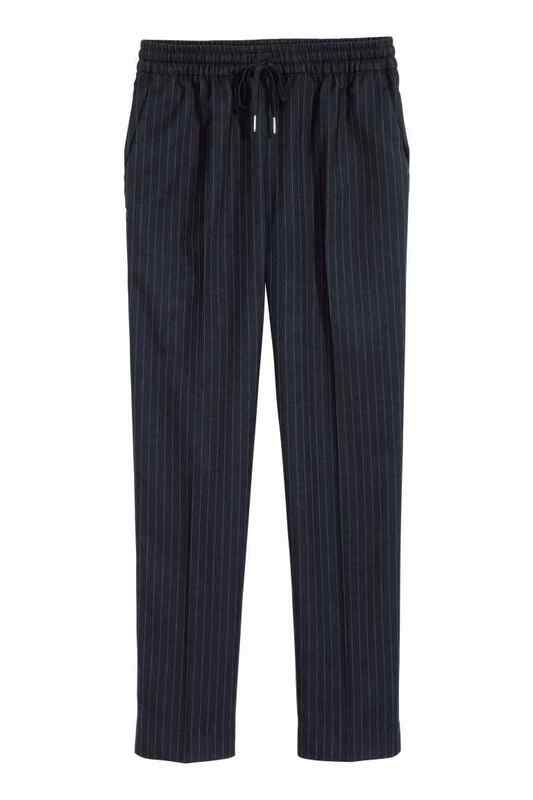 Whilst I was in H&M I also discovered these fab pinstripe navy suit jogger-style trews. Happy days....I now have another casual/smart navy option covered too! These are a seriously good style....so much so I also bought them in the grey too! I think I've nailed my office style for now but I'd love to hear if you have any tips regarding more casual office attire. Back soon....I 'm now paying closer attention to my everyday style and the kind of basics I expect to be wearing this A/W for my days off!